My Raspberry won't boot anymore. I had some problems, with mostly Mysql crashes in the past. But now it won't boot anymore. Not syncing: No working init found. Try passing init= option to kernel. See Linux Documentatio/init.txt fot guidance. Picture of the whole boot. I've found people with this problem, but those are mostly ubuntu and solutions won't seem to apply to debian. I could be wrong on that. The root filesystem used by the kernel is incorrect. On the pi this is specified in cmdline.txt (on the first partition) by root= and for Raspbian should be mmcblk0p2. The rootfstype should be ext4. Solution: Correct the root filesystem parameter. The root filesystem is corrupt. Solution: Run e2fsck on the root filesystem (using another computer). The init file, /sbin/init (sometimes a symlink) or some necessary linked dependency has been moved or erased. Solution: If you did this, put it back. If you did not, reinstall the OS. In most cases for most people these are things you can easily check in order, but if this fails, reinstall the OS. It is unrecoverable by you. 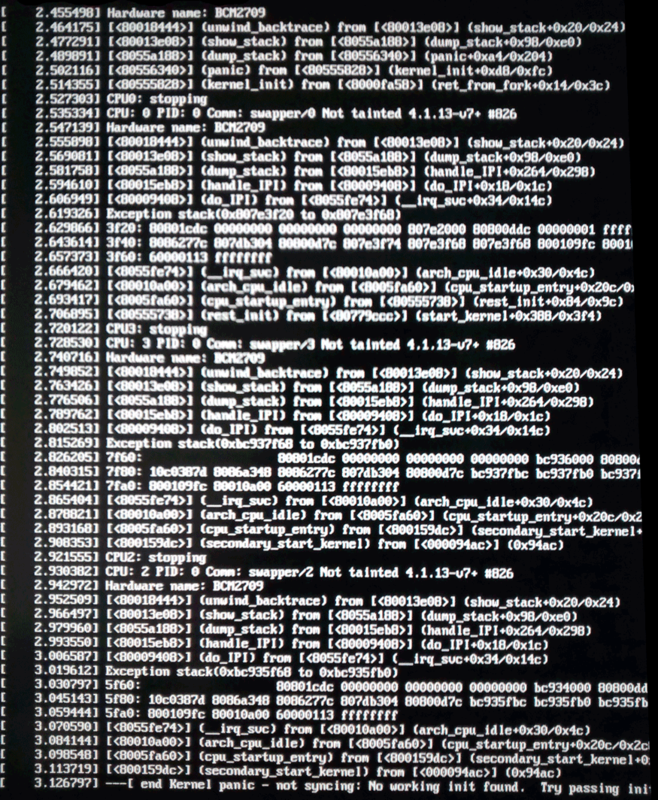 However, in your particular case there appears to be a kernel failure of some sort leading up to this; for a more normal example of a truly missing or bad init, see here. So you could try replacing kernel7.img (that's for the Pi 2, which I think this is) with a fresh one, e.g., from a clean image; most likely the required modules will still be installed on your system. I suggest before you do anything, if possible, you try another SD card with a fresh image on it since this failure could be the result of hardware failure (e.g. bad RAM) and you need to rule that out before you waste time on other things. Mostly no (as in, they do apply) and yes (i.e., you're wrong), although there is a broad range of possible causes. Depending on which era you are talking about, Ubuntu and Debian use different init systems (the first paragraph of that article also describes the essence of your problem, which is true regardless of which init system would have been used) -- one of SysV, Upstart (Ubuntu only) or systemd. I had a similar problem after expanding the file system in My USB. The solution was to substitute the cmdline.txt with the default one. In my case I am using an SD card for booting and the filesystem in a USB (root=/dev/sda2). Follow the commands in this link, and find out in which partition is the OS installed and then give that partition number in the cmdline.txt file in your Raspberry and reboot. This is the only solution which worked. 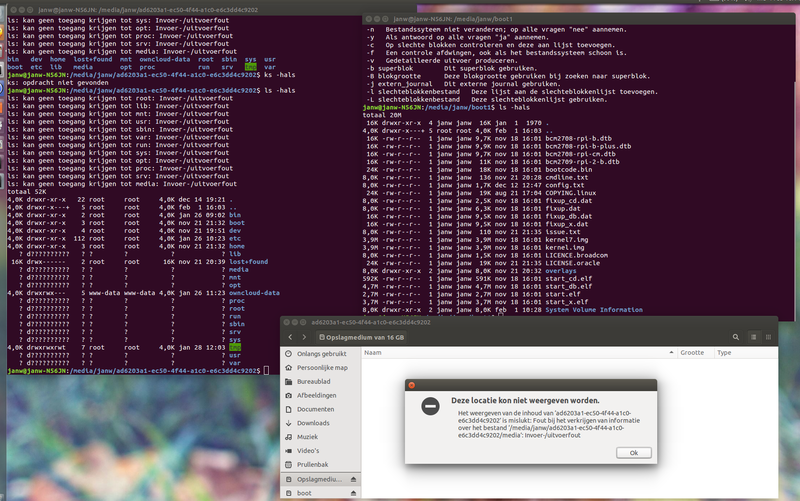 What is the problem of raspbian boot error? How to use cloud-init on an RPi? How can I use an init ramdisk (initramfs) on boot up Raspberry Pi?